Lamps with built-in magnifiers can be a useful tool for a wide range of different activities. The primary use of a magnifying lamp is to provide high-quality light to make the item you are looking at brighter and more visible. Not only are they helpful to anyone who has degenerative eyesight problems like macular degeneration, but they are also fantastic tools to help reduce eye strain and vision fatigue for anyone who needs to focus on minute details any fine work. This can be anything from jewelry making to electronic repair to a whole range of hobby crafts. They are also helpful for professional uses such as dentistry or esthetics that require both magnifying and illumination at the same time. There are many different types of lighted magnifying lamps with an option for every budget. The DeskBrite200 is an inexpensive, well-made desk model that is an excellent introduction to magnifier lamps. It is very versatile and useful for a variety of tasks that are usually performed sitting at a desk or a table. It is relatively compact, so it doesn’t take up a lot of space. It has a flexible gooseneck that allows the user to adjust the position of the head. The DeskBrite200 also enable the user to run it on the AC adapter or by using batteries. Some user reviews mention that the bulb could be brighter as it uses only 2 LEDs for illumination. The size of the lens (4 inches) may be too small for some users to use to read a book without having to move the book from side to side. If you are using this near a computer, you should be aware that it is not ESD-Safe and could cause possible damage to electrical equipment. 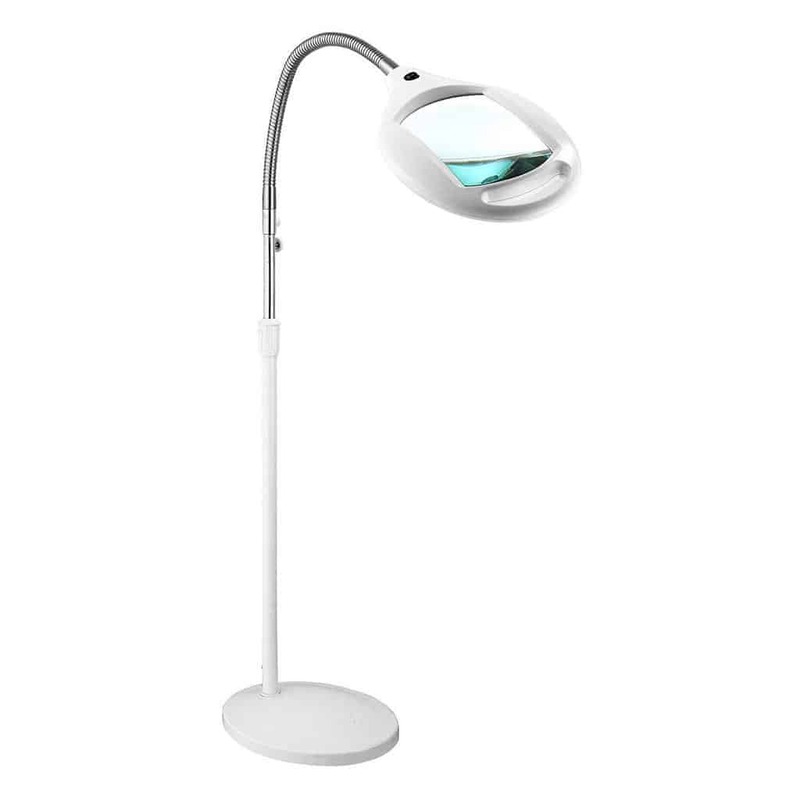 It is a low cost, good quality desk magnification lamp. For the price, you are getting decent magnification and good light. It is compact and bendable and works well using either the wall plug or the batteries. It could do with a bit more weight in the base, but for general use for most people, it will work very well. What do users love about the LightView? This model works well for many tasks including as a crafting tool for knitting, and cross stitches. Users find that the bendable arm makes it very easy to use and is excellent for any fine work. It is also collapsible so, despite its large size, you can store it easily in small spaces when not in use. Most users find the neck very flexible, and it stays in place once the position is set. Some reviewers have noted that some lights stop working right away, so there may be quality control issues occurring. It is another great entry-level illuminated magnifying model. Since it is a floor style, it works well for reading, crafting and many other hobbies. It uses energy-efficient LEDs that (all being well) should last 15-20 years. The height and flexibility of the gooseneck is excellent for most users (the base plus gooseneck will give you a 44″ maximum height). What do users love: This is considered by most users to be a well-made, solid handy device. The arm does not go limp after extensive use as do some of its competitors. It moves quickly and stays in place. The light is bright, and the magnification is excellent. The clamp is exceptionally sturdy and attaches easily to a desk or table giving you more room to work. This very versatile lamp is one of the best options if you are looking to invest in a good quality product. The triple-joint arm has internal cantilever system that lets you adjust without loosening/tightening knobs and surprisingly for its weight it stays in position well. It has a heavy-duty die-cast aluminum clamp with that fits surfaces to 2-1/2″-thick that is easy to move and only takes up 2″ of desk space. The lens has a 3″-diameter with 5-diopter (2.25X) magnification lets you see fine detail. The LED is very bright at 650 Lumens life of 20 years. It has adjustable brightness settings allowing you to customize the lighting for the tasks. What do users love about the Esthology Premium? If you are looking for a device to use in multiple locations, a rolling floor lamp is a good option. 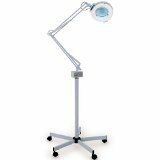 The Esthology Premium is marketed toward beauty professionals, although judging by the reviews users are using this lamp for the same task as other standard lamps. This particular model has an easy assembly, bright, and good magnification. The weighted base and arm control allow the user to position it exactly how they want it. What makes this a top pick is the quality you are getting for the price. The round 8″ fluorescent bulb is a standard stock item and is easy to replace. Other similar products can cost 2 or 3 times as much. This product can serve almost any purpose requiring bright, clean light along with magnification. The five wheels on the legs make it very easy to move, if necessary. What Should Customers be Aware of with the Esthology Premium? While this is an excellent option for home use, many users note it probably wouldn’t hold up to industrial or high traffic use. It is a great rolling base lamp for the price point. The light is very bright, and it is well made and works well for all of the same types of tasks that similar models are used for. The rolling base makes it very convenient to move it from room to room. It comes with a cover to protect the lens. The base is somewhat broad and heavy which is great for the stability of the head although some users may find the bottom a bit large. If you are interested in purchasing this model, make sure that you have enough floor space for the base. Bulb- One of the essential features on these products is the bulb or tube that is used to produce the light. For the most part, these magnifiers use either a fluorescent lamp or a LED lighting element placed around the viewing glass frame. It tends to be the older models that use the fluorescent bulbs, as most new models use LED although there is still a fair amount that uses fluorescent. Newer fluorescent bulbs generally have a more natural and less harsh quality than the “white light” of the older types of fluorescent. If you are turning the switch on and off quickly and frequently, it can reduce the life of the bulb, and they usually take a little while to warm up and reach full brightness. LEDs are durable, long lasting and they also use less energy and emit less heat than fluorescent bulbs. Since LED provides light without heat, they’re also safer to work with, even more, reliable than fluorescent which is typically quite cool. Magnifier- Depending on your intended use for the product you will also want to pay close attention to the magnification level of the lens or the diopter of the lens. Diopter is the amount of curvature a lens will have, the more curvature a lens has means it will have a higher diopter number and more magnification. Figuring out what diopter lens to get depends on the type of task you are using the light for, as well as your own eyesight. Generally, these lenses have a diopter number of 3 or 5. Objects viewed under a three diopter lens will have a magnification of 1.75x and will appear 175% bigger than usual while objects seen under a 5-diopter lens have a magnification of 2.25x and will look 225% bigger than usual. The three diopter lenses would let you view things from farther away (10-13 inches) while a five diopter lens is best for really fine work with small objects. Style- There are four basic styles that you can go with, all with advantages and disadvantage depending on its intended use. Desktop – The desk style models are generally the least expensive and most compact. They are great for most activities where you are seated at a table or a desk. If you are using it near a computer, you may want to look into models that are ESD-safe. Desktop with Clamp-The clamp style is very versatile for most users. You can attach these to workbenches, tables, desks or any work station that you have set up. Depending on what you are clamping the lamp to, you may want to check the measurement of the clamp. Floor Standing Solid Base– If you are interested in a floor light, for reading or crafting, there are some great options available. Ensure that you check reviews to ensure that the base of any product you are interested in has a good weight to it to avoid it falling over. Floor Standing with Rolling Base– A rolling base style is a good option if you are looking for a large floor style that you may be moving from room to room. The only downside of a rolling base is the base can sometimes take up quite a lot of space. If you are using one of these lamps to work with electrical circuit boards and sensitive components you will probably want to look for a model that is Electrostatic Discharge (ESD) safe. There are many higher end magnifiers (Aven, Luxo or Dazor) that are ESD-Safe that have special polymers applied to the lens, and that have passed rigid ESD certification testing standards. When you aren’t using the light ensure that you keep the lens covered, as it could become a fire hazard if it is exposed to any direct sunlight. Some models do not allow you to change the bulb if the lighting stops working (although they are reported to work for up to 100,000 hours) you are out of luck. Generally, you cannot adjust the brightness level on these types of lamps unless you are willing to pay for the higher end brands. Many of magnifier lights eventually go limp at the head, although with careful use and some maintenance (tightening screws) you may be able to avoid this. Unfortunately, like most things the more you pay, the better the features and performance you will get from a lamp with a magnifier. Many users will find that the products that are available in the $40 to $80 range suit them quite well, while others will need the better quality and better quality of the $100 to $150 products from companies like Ott-Lite, ProMagnify, Daylight, Normande, Fulcrum, and HawkEye. If you are planning on using one of these devices a lot and if your budget allows you can look at some of the mid to higher-end models such as Aven, Luxo or Dazor that offer bigger lenses higher magnification and ESD-Safe models. 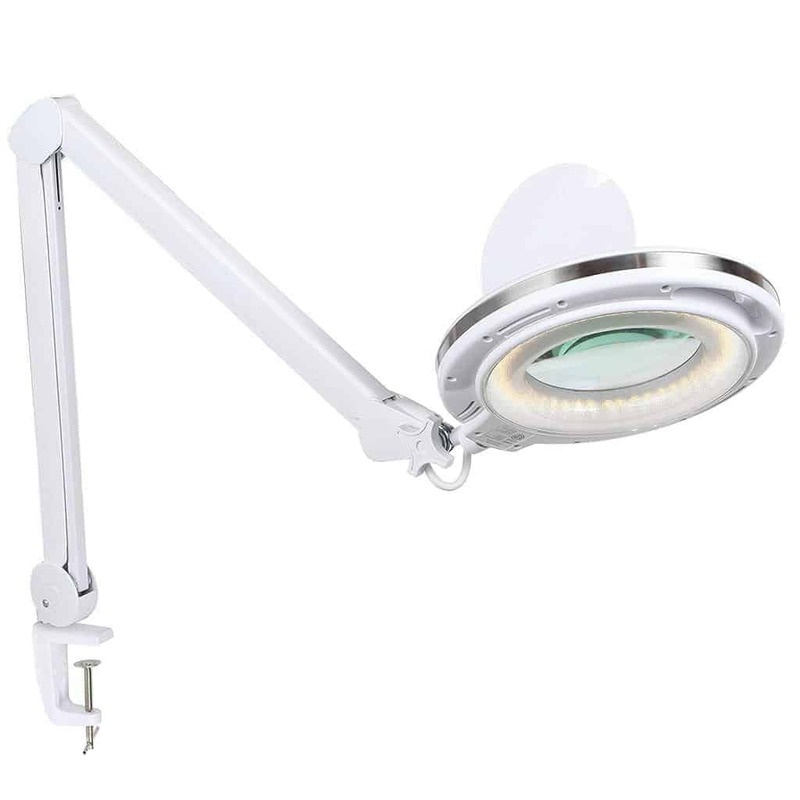 If you are looking for a product with a huge lens, the largest available is the 7″ lens with three diopters (1.75x) lens that you can get on the Daylight Naturalight 7-Inch Magnifying Lamp. Staples have a good selection of lamps available. You can also buy them at Walmart and Sears as well as online with Amazon or eBay. Crafting, fabric/sewing, art supply, and hobby shops are also places that these types of lamps can be found. 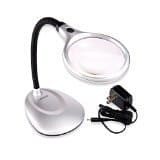 A lighted magnifier is an essential tool for anyone involved in precision assembly or design, but it is also an excellent aid for people who have trouble with their vision. Lighted magnifiers reduce eye strain and fatigue while allowing the user to see the small details of the object being viewed. Many other items from jewelry to specialized craft items have components which are hard to see with the naked eye, so a magnifying glass is often essential when working with them.